BrainInfo is a portal to neuroanatomical information on the Web. It helps you identify structures in the brain and provides a variety of information about each structure by porting you to the best of 1500 web pages at 50 other neuroscience sites. BrainInfo also contains three unique knowledge bases of its own: NeuroNames, which provides the index to brain structures and narrative information about them; the Template Atlas, which shows the structures that are found in the primate brain; and NeuroMaps, a set of several hundred overlays that will show the location of different kinds of information that have been mapped to the standard background maps (templates) of the Atlas. Information about brain structures in other species, particularly the human, is provided by links to other websites. Click here for an informal History of BrainInfo and here for a guided tour of BrainInfo as a Portal to Neuroanatomy on The Web. BrainInfo was developed at the University of Washington, Seattle between 1991 and 2008. Funding for the project was provided by the following divisions of the U.S. National Institutes of Health (NIH): Office of the Director, NLM, NCRR, NIMH and NIBIB. On January 1, 2009 the website was transferred under sponsorship of the International Neuroinformatics Coordinating Facility (Karolinska Institute, Stockholm) to the University of California at San Diego. There it is being integrated with other web-based neuroinformatics resources. Provides information about more than 15,000 neuroanatomical terms. Show me! Defines the brain in terms of about 550 primary structures to which all other structures, names, and synonyms are related. Provides standard English and Latin names for more than 850 unique structures including the primary structures, superstructures and related superficial features. Provides a unique acronym for each structure that is suitable for labeling illustrations, graphs and tables. Defines more than 1500 other neuroanatomical entities in terms of structures in the Hierarchy. The structure you name may not be part of the Brain Hierarchy. For example, it may represent a different way of subdividing the brain or it may exist only at the embryonic stage of brain development. Such items are referred to as 'ancillary structures'. Shows relations of about 9,000 synonyms to the standard names and structures they represent. Shows alternate definitions (homonyms) of terms in the Hierarchy commonly used to denote different structures or combinations of structures. Links to 1500 illustrations of brain structures in four species. To see illustrations of a structure, go to its Central Directory. If NeuroNames has an illustration, the Show It! icon will appear. Click it. In some cases, you will have a choice of viewing the structure in the human, the monkey, the rat or the mouse. BrainInfo may send you to another website to see it. If so, you return to BrainInfo by clicking 'Back to BrainInfo'. Indicates differences in structure of the human brain and the nonhuman primate, macaque brain, and provides the names of structures in the rodent brain regarded as topologically homologous to structures in the human and nonhuman primate brain. A structure that definitely exists only in the human brain is indicated by [H] following its name; a structure only in the monkey is indicated by [M]. Most structures without such designation exist in both. Show me! Is based on Nomina Anatomica with citation of more than 80 supplementary sources. The NeuroNames Hierarchy was developed to provide an indexing structure for computerized knowledge bases of brain structure and function. It represents a systematic, evolving attempt to codify human and macaque brain anatomy by a standard, ordered nomenclature for structures that are defined by gross morphology or cross-sectional histology. It encompasses the classical neuroanatomical nomenclature, i.e., the naming system that is based on stains that distinguish gray matter from white matter in the brain. The hierarchical organization of the core vocabulary of NeuroNames is for the most part consistent with the Nomina Anatomica (Nomina-1983) as supplemented by two texts Human Neuroanatomy (Carpenter-1983, Parent-1996) and The Human Nervous System (Paxinos-1990). Two basic principles guiding development of the Hierarchy have been: 1) to construct an exhaustive, nested set of mutually exclusive VOLUMETRIC STRUCTURES that represents the entire brain at each level of the Hierarchy and, 2) to list all SUPERFICIAL FEATURES with the smallest volumetric structures that encompass them. In navigating the Hierarchy you will find that the volumetric substructures and superficial features are segregated so that you can tell one from the other. If multiple English names are commonly used for a given structure, selection of the term to be used as its standard English name has involved weighing several principles. Briefly, they are to avoid eponyms; avoid Latin vowel combinations that are uncommon in English; avoid terms commonly used for more than one structure; strive for consistency with the names of other substructures of the same superstructure; and give preference to short names over long names. With a few exceptions necessary to produce completely parallel hierarchies in English and Latin, we have resisted the urge to create new, "more logical" names for structures. STRUCTURE is a very general term that refers to the brain or any subdivision thereof as identified grossly or histologically by the nissl-stain/myelin-stain dichotomy. A structure may occupy volume or it may be a superficial feature; it may be primary or a composite of other structures; relative to other structures, it may be a substructure or superstructure within the Hierarchy. NeuroNames also includes many neuroanatomical terms that refer to structures not in the Hierarchy. These we refer to as ancillary terms (see below). A SUBSTRUCTURE is a member of an exhaustive set of mutually exclusive structures that comprise a named superstructure; it may be either a PRIMARY STRUCTURE, i.e., a structure that is not further divided in the Hierarchy, or it may itself be a lower-order superstructure within the Hierarchy. The occipital lobe, for example, is a substructure of the cerebral cortex, but it is the superstructure of the occipital gyri. A SUPERSTRUCTURE or COMPOSITE STRUCTURE is a structure composed of two or more substructures. In listings of the Hierarchy, TERMS IN UPPER CASE represent composite structures; TERMS IN LOWER CASE represent primary structures. Structures found reported in the HUMAN ONLY are indicated by (H); structures found reported in MACAQUE ONLY, by (M). A SUPERFICIAL FEATURE is a part of a structure that adheres to its boundaries but that is not a member of its exhaustive set of mutually exclusive substructures. Two kinds of superficial feature are distinguished: surface features and appendages. A SURFACE FEATURE is a feature without volume; e.g., the inferior olive is a surface feature of the medulla; it is the protruding surface that defines the outer boundary of several volumetric substructures that go by different names. An APPENDAGE is a volumetric attachment to a structure, e.g., the vestibulocochlear nerve, which is an appendage of the metencephalon. An ANCILLARY STRUCTURE is a subdivision of the brain, the definition of which is based on criteria other than the gray-white dichotomy or whose boundaries are not coincident with the boundaries of any of the minimum set of structures that define the Hierarchy. Clicking the hierarchy button for an ancillary term takes one to a definition worded in terms of standard English names of structures in the Hierarchy. Each structure in the NeuroNames Hierarchy is referenced by an ENGLISH DEFAULT TERM, by a LATIN DEFAULT TERM and by a unique ABBREVIATION for use in illustrations and tables. A given structure can have any number of SYNONYMS, which are accessed through the structure's Central Directory. The DEFAULT ACRONYM is usually based on the standard English term (Paxinos-1986). Synonyms can be in any language and appear as spelled in the source. If multiple English names are in common use for a given structure, selection of the term used as its standard English name has involved weighing several principles. Briefly, they are to avoid eponyms; avoid Latin vowel combinations that are uncommon in English; avoid terms commonly used for more than one structure; strive for consistency with the names of other substructures of the same superstructure; and give preference to short names over long names. With a few exceptions, necessary to produce completely parallel hierarchies in English and Latin, we have resisted the urge to create new, "more logical" names for structures. Listing of multiple SPECIES with a given term indicates that the term has been used for topologically homologous structures in those species. The NeuroNames Hierarchy is based on opological homology with the combination of substructures included in a given superstructure based on proximity. These criteria underlie the classical neuroanatomical classification of brain structures and do not necessarily imply homology based on other criteria, such as connectivity, function or ontogeny. For each structure in the NeuroNames Hierarchy we have attempted to determine whether morphologically homologous structures exist in the human, the macaque and the rat and to cite at least one source in which the homology is reported. The ancillary terms are neuroanatomical terms (or terms which sound neuroanatomical) that refer to structures that do not coincide with structures in the Hierarchy. While most of them represent legitimate neuroanatomical entities, they are not necessary elements of the minimal and exhaustive set of mutually exclusive structures required to describe the primate brain. Thus, they are described separately from the Hierarchy. Ancillary terms fall into several major categories. Almost half represent alternate ways of subdividing the brain. Many others sound as though they might be in the brain, but refer to structures outside the brain, e.g., in the spinal cord. Another group consists of terms referring to fiber pathways that are not readily distinguishable in myelin-stained sections. Others are based on cytoarchitectural, myeloarchitectural or embryological characteristics. Some terms referring to structures or areas defined by functional characteristics or by connectivity are also included as ancillary terms. The ancillary terms have been defined as accurately as possible using the default English names of structures in the NeuroNames Hierarchy. Click on the name of any structure in the definition to view more information about it. We have attempted to list at least one authoritative source for each term in each species (human, macaque, rat, or mouse). Most sources listed represent the first publication in which we encountered the term, not the first publication where it appeared. Click the source name to see the reference and an abstract or description of the publication from which the identification of the synonym was taken. For standard English terms as applied to the human brain, the most commonly cited sources are Carpenter-1983, Crosby-1962, Paxinos-1990, and Roberts-1970. For the nonhuman primate brain the primary sources are Bonin-1947, Krieg-1975, Szabo-1984 and Walker-1940. For the rat brain, the sources of standard English terms, as cited in Bowden-1997, are Paxinos-1986 and Swanson-1992; the sources of most terms for structures in the mouse brain are Hof-2000 and Paxinos-2001. For standard Latin terms as applied to the human brain, the most commonly cited sources are Nomina-1983, Riley-1943 and Stephan-1975. For the nonhuman primate brain they are Oertel-1969, Olszewski-1952, and Shantha-1968. NeuroNames is given as the source of a term if a name had to be generated in order to have both a default English name and a default Latin name for a structure in the Hierarchy and no published source for such a term was found. In most cases, such terms are English translations or translations of commonly used Latin names. NeuroNames is also given as the source of the Latin translation of English terms for which no published Latin equivalent was found. Other terms were drawn from more than 70 other publications. The following are publications that include systematic nomenclatures of particular parts of the brain which we have attempted to relate as comprehensively and accurately as possible to the NeuroNames Hierarchy. Many terms from these sources are identical to the standard English or Latin terms for structures in the Hierarchy. Others are synonyms of the standard names. Still others represent alternate ways of subdividing the brain and are described in terms of the standard English names of structures in the Hierarchy. The NeuroNames nomenclature contains about 15000 terms, 2000 of which are acronyms. It allows a complete description of the primate brain in terms of about 900 structures (approximately 580 primary volumetric structures, 130 superstructures and 180 superficial structures). Using NeuroNames, any point in the brain can be located unambiguously to a single primary structure. Thus, mastery of the names, definitions and relationships among about 900 structures should provide one with a working knowledge of the basic neuroanatomy of the brain. Since each of the structures in the Hierarchy has a default English name and a default Latin name, that portion of the nomenclature accounts for 1720 of the total terms. The remaining terms represent ancillary structures or are synonyms in seven languages. With 1500 ancillary structures, synonyms account for almost two-thirds of the total neuroanatomical vocabulary. To explore the Template Atlas Open BrainInfo Again in a separate window and navigate according to the instructions below. 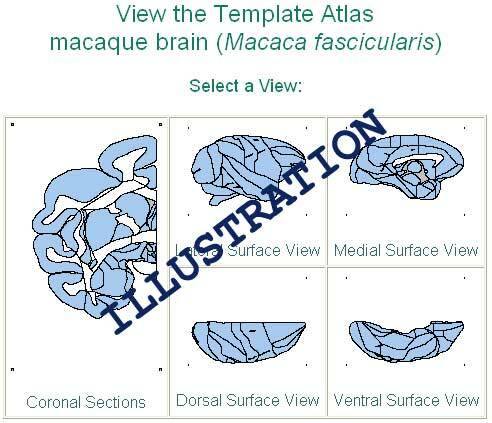 The Template Atlas of BrainInfo is a set of drawings of the brain that includes four cortical views and 58 coronal sections of the brain of the longtailed macaque (Macaca fascicularis). Based on three animals, it is an updated version of the atlas that we first published in 1996. For a detailed description of the methods used in its production see Martin & Bowden, 1996 and Section 3.2: Methods in Martin & Bowden, 2000. 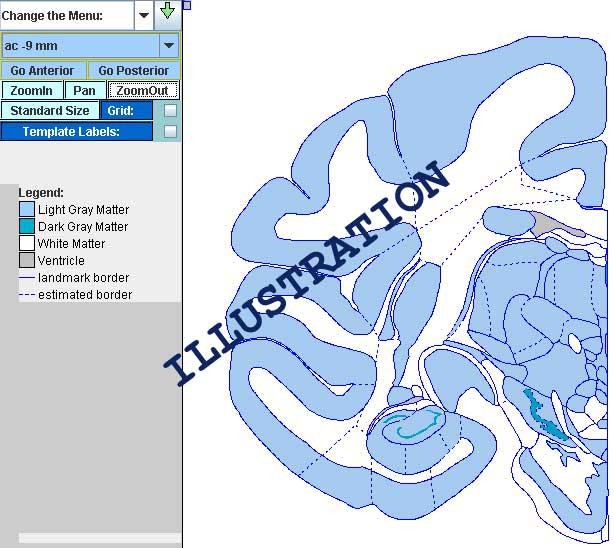 The digital format of the atlas in BrainInfo has been adapted to allow maximal flexibility in display of the templates, e.g., with or without the structure names, the shading of gray matter, the estimated structural boundaries, the stereotaxic scales, etc. Templates in a format suitable for downloading to image processing software to map data for publication are available on a compact disk (CD-ROM) that accompanies the hard copy version of the atlas: Primate Brain Maps: Structure of the Macaque Brain (Martin & Bowden, 2000). To locate a structure by browsing the Template Atlas of BrainInfo, click 'Search Atlas' button. The images below will appear. If the structure you want is part of the cortex, click the appropriate cortical view. If it is a deep structure, click the cross-sectional image. For cross-sectional views the Template Atlas will show you about 30 small images of the brain in cross-section ranging from the back to the front of the brain. Click the image that appears to be closest to the section that interests you and then use the 'Go Anterior' button and 'Go Posterior' button to reach the exact section you want. To zoom on the whole section, click the 'Zoom In' button and then click anywhere on the atlas. If you want to zoom on a particular part of the image, click 'Zoom In' and then click and drag to create a rectangle that contains the area of interest. To zoom out on the whole section, click the 'Zoom Out' button and then click anywhere on the atlas. If you want to zoom out and still view only a part of the images, click 'Zoom Out' and then click and drag to create a rectangle that contains the area of interest. To label structures click on . As in human neurosurgery, the accuracy of brain surgery in nonhuman primates can be greatly aided by noninvasive imaging with magnetic resonance (MR) and ventriculography. These techniques allow the surgeon to direct instruments to their targets based on internal landmarks, such as the anterior and posterior commissures, as well as external landmarks, such as the ear canals, orbits of the eyes, top of the skull, etc. The Template Atlas of BrainInfo was developed and scaled particularly for use with such imaging techniques, as well as for conventional stereotaxis. MRI Stereotaxis: Again, as in human stereotaxis, the primary coordinate system of the Template Atlas is based on internal landmarks. The base plane is perpendicular to the midline and passes through the bicommissural line, i.e., the line defined by the centers of the anterior commissure and the posterior commissure. Zero of all three dimensions is located at the center of the anterior commissure. 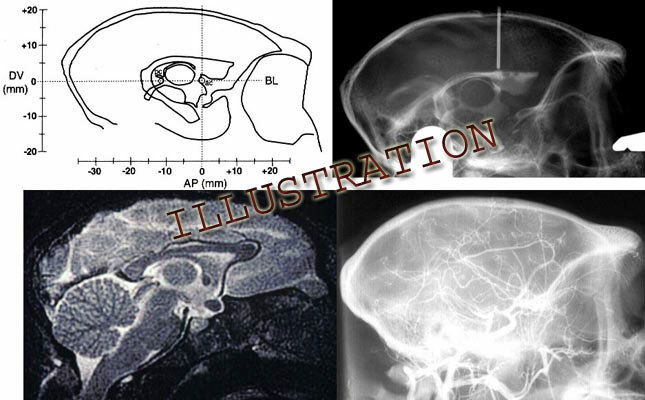 Conventional Stereotaxis: Users with no access to noninvasive techniques can obtain the same degree of accuracy with the Template Atlas that is obtained with the conventional atlases of the longtailed macaque brain, which are based on external, cranial landmarks (Szabo & Cowan,1984; Shantha et al.,1968; see Applicability of the template atlas to other primate species, Chapter 5 in Martin & Bowden, 2000). The interaural line, i.e., the line connecting the tips of the earbars of the stereotaxic instrument, and the top of the brain are the most reliable landmarks for use during brain surgery without imaging. To obtain the estimated location in the experimental brain of any point in the Template Atlas using these external landmarks: 1) estimate the AP (anterior-posterior) coordinate by adding 17mm to the AP coordinate of the Template Atlas, e.g., a point in section ac -15 of the atlas is located at eb +2, i.e., 2 mm anterior to the earbars (eb); 2) determine the distance of the point from the top of the brain in the experimental animal by subtracting the point's DV (dorsal-ventral) coordinate in the atlas from 19 mm, i.e., from the average height of the top of the atlas brain above the base plane; 3) the ML (medial-lateral) coordinate in the experimental brain is the same as in the atlas, since both are measured from the midline. Stereotaxis by Ventriculography: In addition to correcting for the height of the brain above the orbitomeatal plane as indicated above, with a lateral ventriculogram one can compensate for variation in the orientation of the brain. This is done by adjusting the eyebars up or down to make the orbitomeatal plane of the instrument parallel the bicommissural line, and to register the stereotaxic space to that internal referent instead to the top of the brain. In this case one targets atlas structures in the animal by adding the atlas AP and DV coordinates to the corresponding distances of the anterior commissure from earbar zero. A graphical method for calculating the distance that the height of the eyebars should be adjusted is presented in Dubach, 1991. Equations for making the adjustment from MRI landmarks are presented in Martin and Bowden, 1996. Making this adjustment can greatly reduce the error of targeting based on cranial landmarks alone depending on the angle by which the orbitomeatal plane deviates from that of the bicommissural line and the distance of the target from the center of the anterior commissure (Dubach et al., 1985). The graphical solution in the publication cited contains a misprint in the caption of Fig.2. A5 should equal the square root of (A32 - HA2), not the square root of (A32 x HA2). BrainInfo grew out of a concept born with the appearance of the first desktop computers in the mid-1970s. For an informal history see CENTER UPDATE: Issue 2, Spring 2001. 1991 Version 1 of NeuroNames programmed in HyperCard, copyrighted and issued on diskette for the Macintosh. 1995 NeuroNames Hierarchy peer reviewed and modified for publication (Bowden, 1995). Superstructures pruned to eliminate disputed categories; primary structures added and subtracted to conform to 12 recent texts and atlases. 1996 Version 2 of NeuroNames English Hierarchy incorporated into the Metathesaurus of UMLS (Source Vocabulary NEU95). 1996 Template Atlas of the Primate Brain with structures labeled according to NeuroNames peer-reviewed and published in condensed journal format (Martin, 1996). 1997 Template Atlas website established with downloadable templates for plotting neuroanatomical data. 1997 First edition of the complete Template Atlas published by Primate Information Center (Martin, 1997). 1998 Version 3 of the NeuroNames Hierarchy. Major changes were to clarify structures found only in the human or only in the nonhuman primate brain, to include subdivisions of some structures that were previously primary structures, and to simplify some of the more cumbersome standard terms, e.g., "amygdala" for "amygdaloid nuclear complex." 1998 Version 3 of NeuroNames English Hierarchy submitted for incorporation into 1999 Metathesaurus of UMLS (NEU99). 1998 Semantic network of NeuroNames extended to define several hundred brain structures in terms of the standard terminology of the Hierarchy and to provide synonyms for structures in the rat brain regarded as morphologically homologous to structures in the Hierarchy (Bowden, 1997). 1998 NeuroNames website established with Web interface to the Digital Anatomist to show Hierarchy structures in the human brain and with internal interface to the Template Atlas of the Primate Brain to show structures in the macaque brain. 2000 NeuroNames Hierarchy updated and about 4000 synonyms for hierarchy terms incorporated into the UMLS (NEU99). 2000 NeuroNames and Template Atlas, including templates for downloading, incorporated into Primate Brain Maps: Structure of the Macaque Brain, a book and compact disk combination issued by Elsevier Science. 2001 NeuroNames and Template Atlas website incorporated into BrainInfo website; symbolic information transferred to MS Access database; image information transferred to MapObjects (ESRI/ArcInfo) and Java software; server programmed in Visual Basic; links established to PubMed (NLM), to more than 300 brain images at other websites: Digital Anatomist (University of Washington); LONI (UCLA); Whole Brain Atlas (Harvard), to a site that describes the cells in specific structures (SenseLab/Yale) and to sites illustrating the species studied (Wisconsin RPRC, Primate Gallery, Washington RPRC). Other additions: the ability to search in Italian (1000 terms), Spanish (660 terms), and Russian (420 terms); a stereotaxic brainstem atlas of the rhesus macaque in sitting posture; PubMed citation counts for all English and Latin synonyms. Average use: 34 visitors/day viewing 1100 pages/day. 2002 First NeuroMaps incorporated: capability for display of overlays on the Template Atlas to compare macaque cortical areas as defined by Brodmann (1909), Mauss (1908), the Vogts (1919), and Walker (1940); NeuroNames-2002 CD distributed to 15 other websites for use as neuroanatomical index or linking into BrainInfo; links established to Mouse Brain Library (University of Tennessee) to illustrate 300 structures in the mouse brain; DICTIONARY added to the sidebar, so when users are sent to another website they can look up unfamiliar terms without leaving that website; Russian structure names increased to 930, Spanish to 790, Indonesian to 1139. Average use: 46 visitors/day viewing 1300 pages/day. 2003 Brodmann's areas in human linked to illustrations of Areas of Cortex Involved in Language (University of Washington) and to 3-D reconstruction of human cortex LONI (UCLA); COMMENTS capability added to allow visitors to read and submit comments linked to every fact recorded in BrainInfo; German structure names incorporated (711 terms); NeuroNames reprogrammed in XML to allow generation of Hierarchy on the fly. Survey of first 10,000 visitors to BrainInfo showed reasons for visiting were research interest: 35%, educational: 35%, curiosity: 20%, clinical interest: 10%. Average use: 120 visitors/day viewing 4300 pages/day. 2004 Addition of Percent Overlap tool that allows one to select a cortical area, obtain a list of structures that overlap it and view their percents overlap; addition of NeuroMaps of 38 cytoarchitectonic areas of macaque cortex by von Bonin and Bailey (1947) and photomicrographs of the internal structure of 150 cortical areas; interoperability established with the Brain Architecture Management System (BAMS, USC, Los Angeles) to display connectivity among brain structures based on some 10,000 reports from studies in the rat; links established to more than 700 high resolution photomicrographs of the macaque brain in three planes of section at Brain Atlas Project (Center for Neuroscience, UC Davis), 50 illustrations of cortical areas in flat maps, inflated maps and surface views at Van Essen Lab (Washington University, St. Louis) and 120 illustrations of human brainstem and spinal cord structures at Medical Neuroscience website (Loyola University, Chicago). Addition of some 1700 neuroanatomical terms and acronyms from the rat brain atlas of Swanson-1998 and the mouse brain atlases of Hof-2000 and Paxinos-2001. Average use: 240 visitors/day viewing 9000 pages/day. 2005 Links established to: Van Essen Lab (Washington University, St. Louis) for connectivity information on 50 structures; images of 59 structures in Atlas of the Human Brain (Heinrich Heine University, Duesseldorf, Germany); gene expression in 122 structures at GENSAT (gene expression database, Rockefeller University and NLM); 383 photomicrographs of structures in macaque brain slide collections at BrainMaps (University of California, Davis); 30 photomicrographs of brainstem structures at the Washington National Primate Research Center (Seattle); 60 illustrations of brain structures at YUMC (Yonsei University, Seoul, Korea); 35 illustrations of cerebellar structures at Atlas of Human Anatomy (Sinel’nikov, Russia); 235 nissl-stained sections of human brain at the Brain Biodiversity Bank (Michigan State University). A new section – Tools & Methods - was added to BrainInfo. It includes nomenclatures of canonical atlases and NeuroNames for human and macaque neuroanatomy, Primate NeuroMaps (individual templates of macaque brain that can be downloaded for publication or for warping), and methods used to create a 3-D brain atlas. Average use: 230 visitors/day viewing 15,000 pages/day. 2006 Updated the 2D Macaque Brain Atlas to highlight structures and follow them through all applicable sections, and to display overlap between structures. Links established for display of 286 mouse brain structures in coronal sections, 303 in sagittal sections at the Allen Brain Atlas (Seattle); 87 dissected structures at the Center for Biostructure, Medical University, Warsaw; 40 structures at the Institute of Anatomy, University of Vienna; 35 structures of the fetal mouse brain at GenePaint (Max-Planck Institute, Hannover, Germany); 32 structures at the Anatomical Atlas where is this? ; and 65 illustrations at other websites. Completed definitions, photomicrographs and mapping to the Macaque Brain Atlas of cortical areas by Brodmann-1909 (30 areas), Mauss-1908 (31), Vogts-1919 (29), Walker-1940 (13), Bonin-1947 (35). Tools and Methods section expanded to include Nomenclature for the rat brain from the Swanson-2004 atlas. The website servers were updated to improve atlas speed, reliability and security, and BrainInfo acquired a shorter new address: www.braininfo.org. Average use: 330 visitors/day viewing 17,700 pages/day. 2007 Definitions added for anatomical planes and some 400 neuroanatomical terms, including 300 terms in French. Links established for illustration of structures at: Nature Neuroscience; Keio University; University of Portsmouth; Human Psychophysiology; Brain: a Journal of Neurology. Linked to Gray's Anatomy on Wikipedia for the illustrations of Brodmann areas and to Histologischer Atlas im Internet for the illustrations of spinal cord structures. Established interconnectivity with Mouse Genome Informatics (MGI) for information on gene expression (92 structures). Expanded Tools & Methods section by adding “NeuroNames 2004: Mouse and Rat Brain Atlas Nomenclatures.” Average use: 384 visitors/day viewing 24,604 pages/day.